AESS held its annual meeting at Duquesne University in Pittsburgh last week. Having participated in the first AESS meeting (in Madison in 2009), I found it a truly interdisciplinary meeting of scholars interested in environmental education. This remains so four years later; the variety of topics discussed was matched by the variety of approaches to those topics. Within the three Flows of Waste panels alone, we had discussions of sewage, e-waste, MSW, ambient lead and soil testing strategies, construction and demolition waste, theoretical approaches to flows of waste (featuring an excellent Google Earth presentation by Samantha MacBride), and more. My own contribution was a history of how solid waste and recycling have been managed in the Chicago metropolitan area since the beginning of the twentieth century. Other panels and field trips saw similarly diverse discussions of such topics as food systems, fracking, climate change, ecoliteracy, and university-community approaches to environmental education. One of the conference keynote addresses was Joel Tarr’s discussion of the region’s environmental history, following from his edited volume Devastation and Renewal. 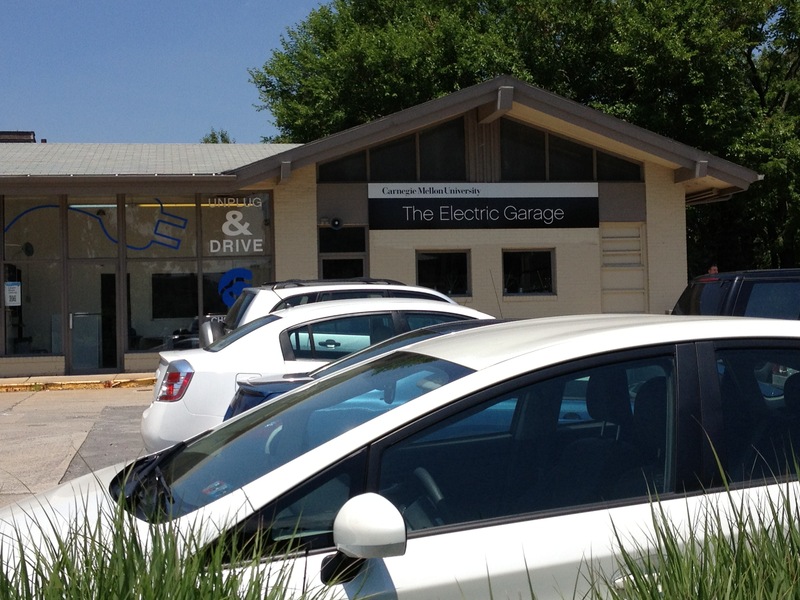 Carnegie Mellon University’s Electric Garage on Forbes Avenue has replaced an old filling station. net zero carbon emission campus scheduled to open this fall. Finally, walking to the bus to take me to the airport, I noticed the decrepit old gas station on Forbes Avenue in Oakland had been taken over by Carnegie Mellon and transformed into an electric vehicle charging station and ZipCar site. Overall, AESS in Pittsburgh was an inspiring combination of theory and practice without limitations of disciplinary boundaries. Next year’s conference in New York City promises to continue the conversations. This entry was posted in events on June 26, 2013 by Carl Zimring.